The Honda CR-Z hybrid sports coupe has created quite a buzz since it was unveiled in 2013. Before it was even shipped to dealers, the CR-Z website received more than a million hits. In one of superstar singer Jason Derulo's biggest videos, "Ridin' Solo," the CR-Z is featured in three or four scenes, looking like a million dollars in fantasy sequences. The 2016 Honda CR-Z gets 39 mpg highway/36 mpg city and is the only hybrid sedan in the world that comes with a manual transmission. Only two questions remain: Why aren't you driving a stylish and fuel efficient Honda CR-Z? And what does CR-Z mean? The latter answer is, CR-Z is an acronym for Compact Renaissance Zero, which is a reference to its classification as an Advanced Technology Partial Zero Emissions Vehicle (AT-PZEV). The only reason you are not currently driving a new Honda CR-Z is either because you never heard of it, or you haven't taken one for spin yet. You are welcome to test-drive the this amazing hybrid sportster at Manly Honda, CA, conveniently located at 2777 Corby Ave. in Santa Rosa, CA. 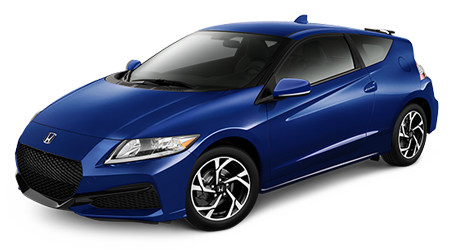 We have a nice selection of the Honda CR-Z in all the most popular models and colors. Our service area now includes Petaluma, Rohnert Park, Sebastopol, and Sonoma, so everyone is invited to see the beautiful and eco-conscious 2016 Honda CR-Z. Even if you can afford a hypercar, you would be wise to check out the 2016 Honda CR-Z, just for thrill of it. When Honda produces a head-turning two-seater sports coupe with a hybrid engine, you know the world is changing. If you currently drive a coupe, or have always wanted a sports car, it's time to step up to the awesome hybrid Honda CR-Z. Take one for a test drive at Manly Honda, 2777 Corby Ave. in Santa Rosa, CA. We extend our invitation to everyone in Petaluma, Rohnert Park, Sebastopol, and Sonoma. We hope to see you all soon!